Monthly Review Press, 9781583673003, 375pp. In this path-breaking book, Jeb Sprague investigates the dangerous world of right-wing paramilitarism in Haiti and its role in undermining the democratic aspirations of the Haitian people. Sprague focuses on the period beginning in 1990 with the rise of Haiti's first democratically elected president, Jean-Bertrand Aristide, and the right-wing movements that succeeded in driving him from power. Over the ensuing two decades, paramilitary violence was largely directed against the poor and supporters of Aristide's Lavalas movement, taking the lives of thousands of Haitians. 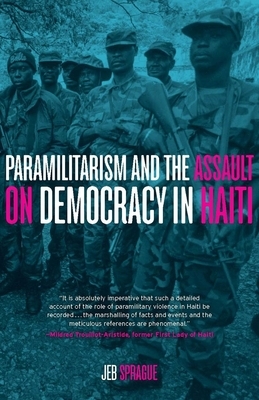 Sprague seeks to understand how this occurred, and traces connections between paramilitaries and their elite financial and political backers, in Haiti but also in the United States and the Dominican Republic. The product of years of original research, this book draws on over fifty interviews--some of which placed the author in severe danger--and more than 11,000 documents secured through Freedom of Information Act (FOIA) requests. It makes a substantial contribution to our understanding of Haiti today, and is a vivid reminder of how democratic struggles in poor countries are often met with extreme violence organized at the behest of capital.